Today’s Job Openings and Labor Turnover Survey (JOLTS) report shows there has been little change in the labor market for America’s workers. The rate of job openings actually decreased in August to 5.4 million. At the same time, the hires rate held steady while the quits rate remains depressed. Coupled with jobs reports so far this year, today’s report provides more evidence of a slow moving economy, with meager wage growth and employment growth that’s just keeping up with the growth in the working age population. There is still a significant gap between the number of people looking for jobs and the number of job openings. 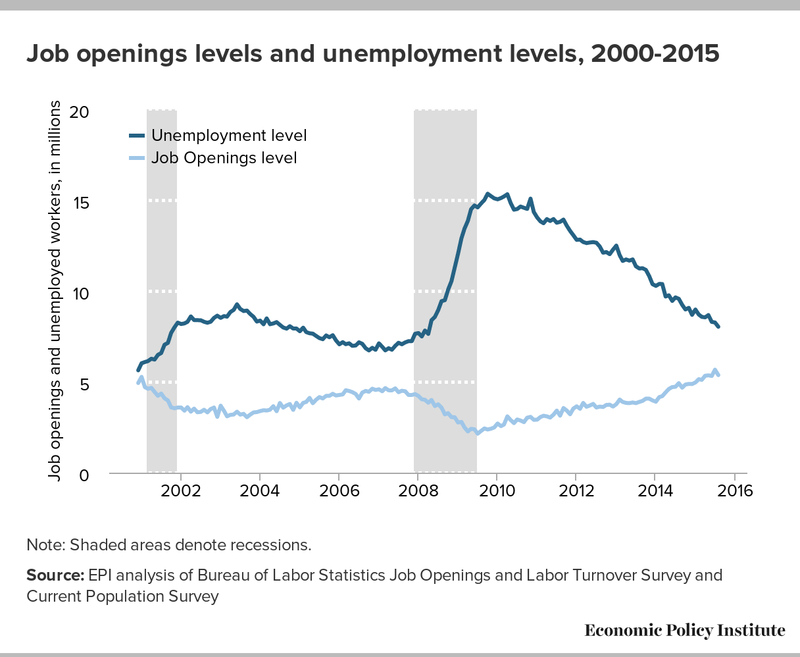 The figure below shows the levels of unemployed workers and job openings. You can see the labor market improve over the last five years, as the number of unemployed workers falls and job openings rise. In a stronger economy (like the one shown in the initial year of data), these levels would be much closer together. Today, there are still 1.5 active job seekers for every job opening. Furthermore, on top of the 8+ million unemployed workers warming the bench, there are still four million workers sitting in the stands with little hope to even get in the game. Meanwhile, the figure below shows the hires, quits, and layoff rates through August 2015. The layoff rate was unchanged in August. 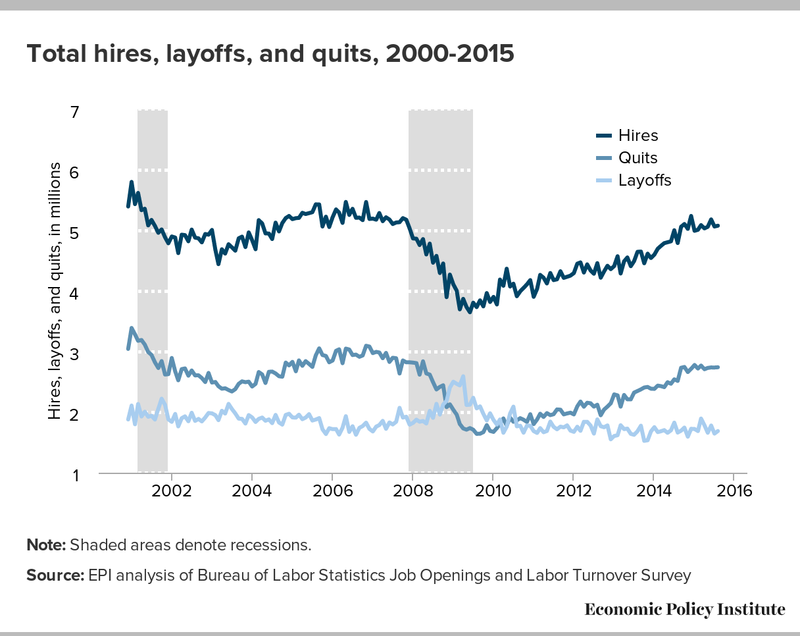 While layoffs, which shot up during the recession but recovered quickly, have been at pre-recession levels for more than three years, the hiring and quits rates need to pick up. The hires rate held steady in August, and is still below where it was at the end of 2014. The voluntary quits rate also held steady at 1.9 percent in August, where it has sat for eight of the last 12 months. In August, the quits rate was still 9.2 percent lower than it was in 2007, before the recession began. This is evidence that workers are stuck in jobs that they would leave if they could. A larger number of people voluntarily quitting their jobs would indicate a strong labor market—one in which workers are able to leave jobs that are not right for them and find new ones. Before long, we should see a return to pre-recession levels of voluntary quits, but we are not there yet. As with last month’s JOLTS report, there do appear to be early signs of some sectoral tightening. 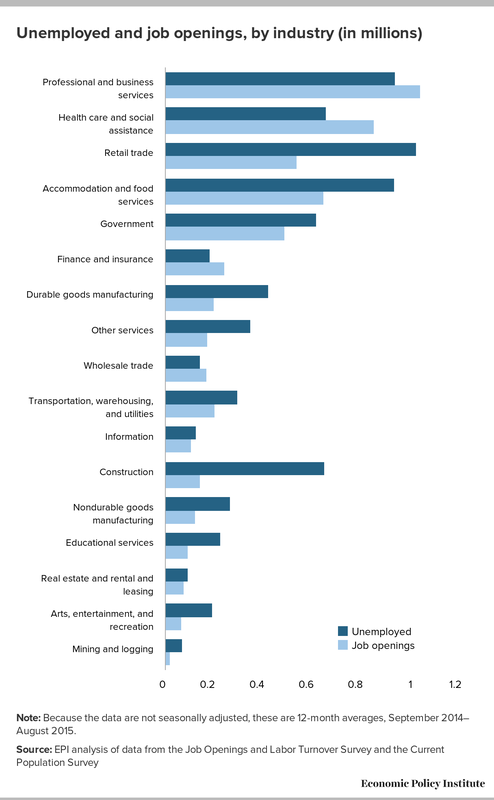 Last year at this time, there were more unemployed workers than job openings in every sector. As you can see in the figure below, some sectors have seen improvements, particularly health care and social assistance and finance and insurance. This within-sector tightening is a small sign of good news, but other sectors have seen little-to-no improvement in their job-seekers-to-job-openings ratio. There are, for example still 45 unemployed construction workers for every 10 constructions jobs. In other words, despite claims from some employers, there is no shortage of construction workers. (Of course, unemployed workers in one sector can sometimes find a job in a different sector, but the disproportionate numbers of job seekers in some sectors is still troubling. )In fact, while the market does appear to be improving for some types of unemployed workers, there are no significant worker shortages anywhere in the economy. Note: Because the data are not seasonally adjusted, these are 12-month averages, September 2014–August 2015. Taken as a whole, these numbers demonstrate that the main problem in the labor market is a broad-based lack of demand for workers—not available workers lacking the skills needed for the sectors with job openings. This morning’s JOLTS report is further evidence that the economy has ways to go before it can be considered healthy. With Congress gridlocked, the most important policy lever we have at our disposal is interest rates controlled by the Federal Reserve. The Fed has rightfully continued to hold the line and should continue to let the economy grow, and not do anything to slow down our recovery.